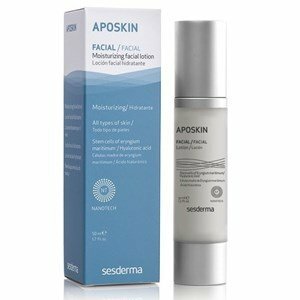 Aposkin is a facial lotion that allows significantly improvement of skin hydration since the first application! Ideal treatment to prevent skin aging. Attenuates wrinkles after the third application. Possesses a high concentration of mineral salts, elements such as calcium, magnesium, silica, and vitamins. Contains ADS11, obtained from seaweed and marine plants, which increases the synthesis of molecules that retain water in the skin, such as hyaluronic acid and dermatano sulfate, providing hydration and oxygenation of the skin. Composition: Stem cells of Eryngium Maritinum, palmitoyl tripeptide-5, hyaluronic acid. Apply the product to the face by morning and/or at evening, performing a gentle massage until its complete absorption. Pregnant women and moms who are breastfeeding can use their anti ageing creams?